I can’t avoid it: Kiddo and New Kid love superhero books. 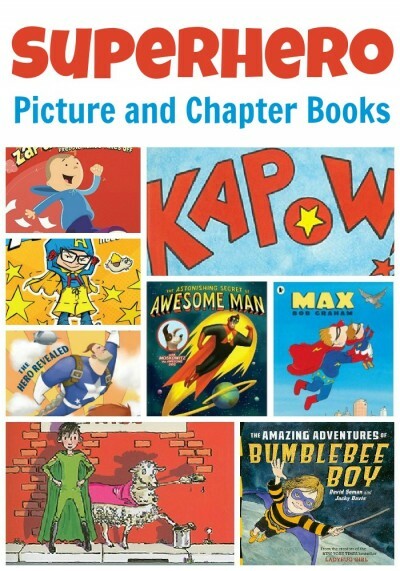 Since I would like them to explore book about non-licensed characters as much as possible I’ve put together as list of mom-approved Superhero books, both picture books and chapter books. Kapow! Friends engage in some spirited pretend play, making a mess but performing some heroic clean-up. SuperHero ABC. Amazing alliterative and alphabetic action will tickle your brain. The Astonishing Secret of Awesome Man. This writing was actually a little to self-congratulatory for my tastes, but I include it because the boys thought it was great, which is what matters in the end, right? Max. Sometimes the best superpowers are the gentlest ones. Zapato Power. I’m not an expert, but I’m guessing there are very few Latino superhero characters out there. Freddie charms readers as he learns how best to use his new superhero shoes. This is a great series for readers just starting out with chapter books. Four books in the series. Grades 1+. Melvin Beederman Superhero. It’s tough when your weakness is bologna, because there is a lot more deli meat than kryptonite on planet Earth. His side kick and best friend is a girl, Candace. Watch out for some seriously silly puns. There are 8 books in this series for early readers. Grades 1+. Captain Awesome to the Rescue! A brand new series Kiddo is enjoying and suitable for readers just beginning chapter books. It’s pretty silly, if your kid likes Captain Underpants, he’ll probably like this one, too. Six books in the series (so far). Grades K+. Do your kids like superheroes? One thing that bothers me is that I don’t come across (non-licensed) girl superheroes who are the main characters very often. In fact, other that the aforementioned Ladybug Girl, I can’t name any, can you? Oh, that looks good. Thanks for the suggestion, Kate. Emma and Johnny have both recently become superhero-crazed – thanks for this list, and I'll be looking for Zita the Spacegirl, too! THANK YOU!! For these links and thoughts! My classroom theme is superheroes and I am trying to get the message to the kids that we all have “super” abilities. These look like some great additions to our class library and end of day reading time!! So glad you find the list useful! Try the Princess in Black…she’s a great superhero and funny, too! I do have Princess in Black on another list (I wrote this one before it was published), it’s a great book. We haven’t read Flora & Ulysses yet, but my son keeps telling me to get it! Thanks for this very helpful list. I’d like to add one that was really popular with both the boys and girls in my neighborhood recently, it’s titled “The Awesome Adventures of Pickle Boy”. The author lives in the neighborhood and makes himself available to his young fans. I read it to my lids, it’s exciting, keeps the kids attention (as well as mine) and it’s great, clean fun. Aside from our local bookstore, I believe it’s available on Amazon and other online sellers. Yes, I totally agree! I desperately need to update this post.